I got a new toy for Christmas this year! I have always wanted a spiralizer and it is everything I hoped for. 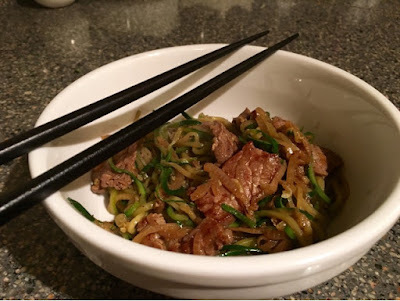 We made a zucchini noodle and steak stir fry this weekend and it was delicious. 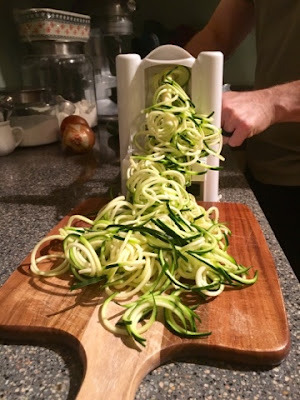 The spiralizer was easy and fun to use. 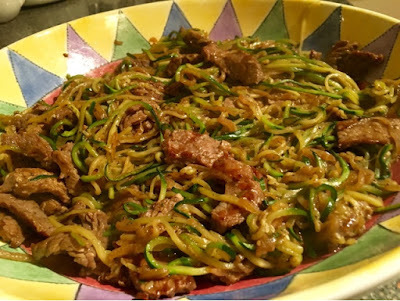 This recipe was healthy and delicious and enjoyed by all. Spiralize your zucchini into noodle shape. 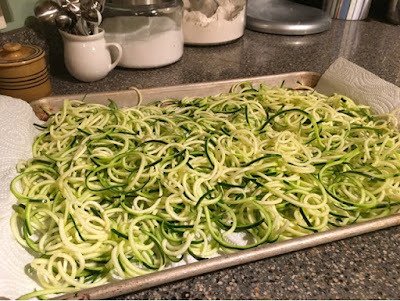 Place on a baking sheet lined with paper towels to absorb the excess liquid. 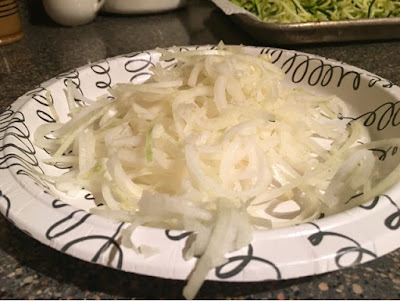 I also used kitchen shears to cut the extra long pieces into smaller noddles. Cut your flank steak into thirds and trim any fat. 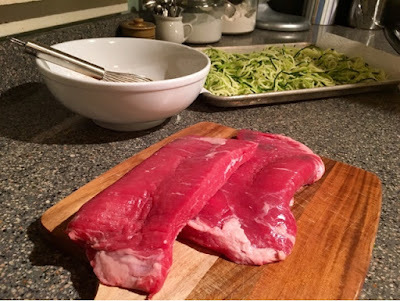 Flank steak can be tough if it is cut improperly. You have to cut AGAINST the grain. You will see a natural grain (or lines) in the meat - do not cut in the same direction as the grain (or the lines). Cutting against the grain (opposite of the lines) will ensure the most tenderness. I like to cut my flank steak very thinly against the grain, at a diagonal. 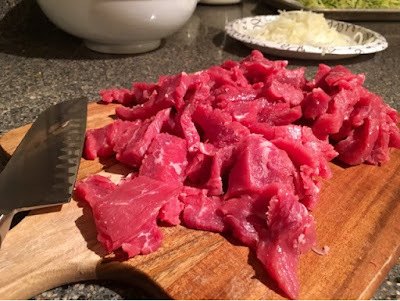 Cut with a sharp knife, almost filleting the pieces you are cutting, that is how thin you want them to be. Watch this video for more explanation about cutting against the grain. Mix together in a large bowl the soy sauce, sherry vinegar, ground ginger and cornstarch. 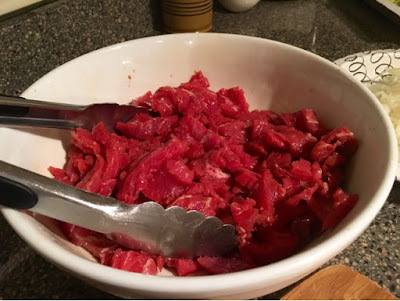 Add the sliced beef and toss to coat evenly. 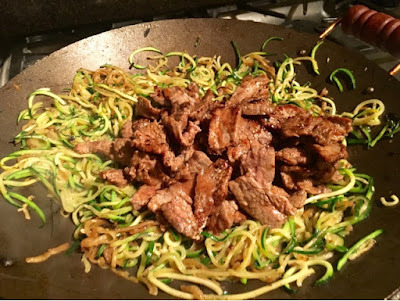 Set aside to marinade for 10 minutes..
Heat a wok or large skillet over HIGH heat. Add 1 tbsp of canola oil and cook the steak in batches for 2 minutes on each side. 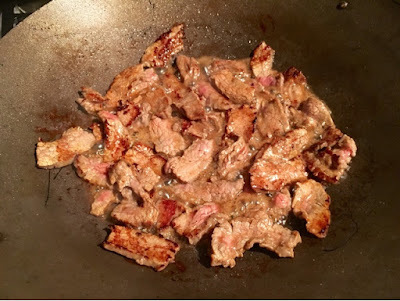 You want the pan to be super hot so you get a nice sear on the outside of the steak. If the pan is too over crowded it won't get the sear. Once the steak is cooked, set aside. 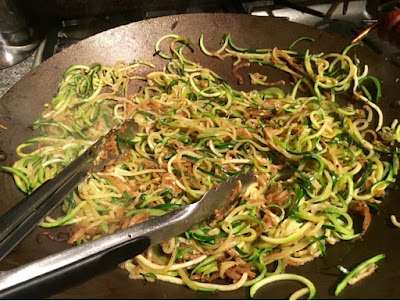 Heat the wok back to high heat, add another tbsp of canola oil and cook the zucchini noodles, also in batches for 1-2 minutes to warm though and soften. You don't want to over cook it so this will go fast. 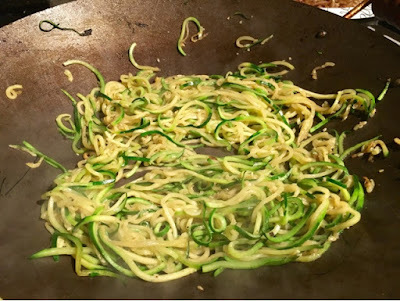 Cook the onion and minced garlic for 1-2 minutes until soft and lightly browned and add the cooked zucchini back in the wok. Now add the cooked steak back in and toss to combine. Let it cook for another minute to warm the steak. 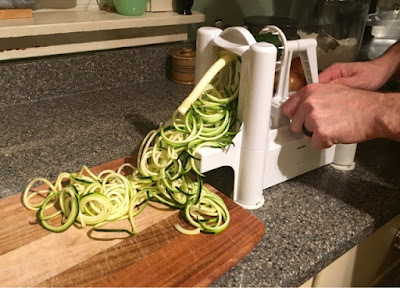 This was a big hit in our house for dinner. My son Jack especially loved this meal and enjoyed eating it with chopsticks.